Roofing North Hollywood | JAD Roofs, Inc.
we install and maintain it. WE ARE JAD ROOFS, INC.
Every building must have it. New or used, we install and maintain it. We are JAD Roofs, Inc. (license # 852824) and we help you with all of your roofing needs.If you’re like most people, you don’t think of your roof until shingles are falling off with the first wind, or, it starts to rain. One day, you have a “drip, drip” on your forehead, and the next, buckets-full are pouring down and you’re bailing out as quickly as it comes in. Roofing inspections need to be done every year to assure you don’t have these urgent problems… no matter the age. But, when you do, it’s good to know that JAD is just a phone call away 24/7/365, rain or shine. All you have to do is sit back and let us fix the problem… whether big or small… home or commercial property… we’re here to help. JAD is the expert to call. We take the time to sit down with you, explain all the choices, the pros and cons of each material and help you determine the best roofing solution for your home or building…and within your budget. 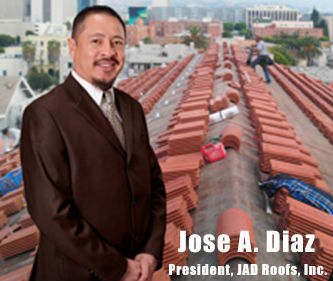 Certified as a Shingled Roof Inspector with the City of Los Angeles, JAD will oversee every aspect of your shingled roof project from start to finish to inspections to certification. And, for all roofing projects, we have a JAD inspector on your job site throughout the project, guarantying all work with a 100% warranty on materials and labor. No job is too large or too small for us to handle. We will take care of the smallest detail for you and leave your site as clean as when we arrived. JAD has built our business on referrals only. You can feel confident knowing you made the right choice with JAD. JAD is experienced in roofing, and roofing-related inspections. JAD tells you the condition of the roof and gutters, flashings, chimney and caps, vents, algae growth, etc and what needs to be fixed (if anything). No matter when you need us, JAD is here to help. JAD prevents messes and cleans up after their work is finished.